Do start each day by opening your drawers or walking into your closet only to hang your head in despair? Are you frequently overwhelmed by the contents of your wardrobe? Do you regularly feel even though you may own multiple items of clothing- that you have nothing to wear? Have you recently lost or gained weight and are holding onto clothing in the hopes of one day being able to wear it again or the fear of growing into it again? Are your closets and drawers overstuffed to the point that you cannot easily close them or identify what’s inside? Have you tried in the past to declutter your wardrobe to no avail? If you answered “yes” to any of these questions, keep reading. I will show you the simple, practical steps I have taken to declutter and obtain a manageable/streamlined wardrobe that I love. You may own hundreds of articles of clothing, yet when faced with the choice of what outfit to put together on any given day, you are suddenly paralyzed with indecision. According to researchers, this is a real phenomenon. It’s called “decision fatigue“. Decision fatigue refers to the deteriorating quality of decisions made by an individual, after a long session of decision-making. In a nutshell, a person makes tens of thousands of decisions in a day; pants or skirt, cream or sugar (or both), bagel or croissant, coat or sweater, car or bus and you haven’t even made it out of the door yet! The concept of decision fatigue states that the more decisions a person makes in a day, the less effective those decisions become. You may find yourself at a 3:00 PM class or meeting unable to decide on the topic sentence for your term paper, or the focus of a sales pitch simply because you have “used up” your decision-making on all the little decisions earlier in the day. Likewise, President Obama prefers to limit his non-essential decisions by choosing the same blue/gray suits to wear each day. Whether you agree with his policies or not, he’s mastered the art of a simple wardrobe. So, what am I saying? Am I telling you that in order to declutter your wardrobe you have to get rid of everything you own/love and live a stark existence wearing one, monochromatic outfit? Only if you want to. I just wanted to put things in perspective before you begin your clean-out. If some of the most successful/powerful people in the world can scale back their wardrobe, so can you. You may be wondering why I recommend you prepare yourself first. Why not just start weeding through your piles of clothes immediately? Because the REAL first step in decluttering your wardrobe is to mentally and physically prepare yourself. Grab yourself a tall glass of water/tea/wine, put on some comfy clothes, and download a playlist of relaxing or energetic music; (or work in complete silence if you prefer). If you have little ones, make sure they are napping, in bed for the night, or see if someone can entertain them for you while you work. You need to be as distraction-free as possible. If dinner needs to be on the table sometime within the next couple of hours, be prepared to order take-out or wait until another time to begin this process. Your schedule needs to be cleared. I will forewarn you, decluttering your wardrobe will take time, especially if you have a lot of clothing. Plan for 2-6 hours (for some people, it takes longer). Don’t let the time it will take scare you off. After all, it took you a lot longer than 2-6 hours to accumulate your over-stuffed wardrobe. Trust me, the effort will be worth it in the end and you will be ready to tackle your accessories, handbags, and shoes. That’s right, you don’t have to touch them. Yet. Once you decide which articles of clothing you love and want to keep, then you can decide which accessories, handbags and shoes complement them. You can save this for another day. Baby steps. Are you ready to begin your journey towards a more simple, decluttered wardrobe? I hope so! 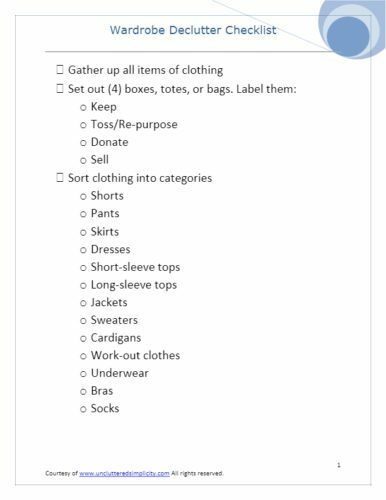 Get your free printable checklist to help you Declutter Clothes! *PS: This is a HUGE post, full of tons of information! If you’d like a free PDF of this guide, scroll to the bottom of this page for a downloadable copy. Or, PIN FOR LATER. The first, and (for some) most difficult step you need to take in order to declutter your wardrobe is to remove ALL items of clothing (except for your accessories, handbags, and shoes) from your closets, drawers, laundry baskets, behind the couch, etc. and place them in an open area where you can begin sorting. This step is essential because it acts as a form of “shock treatment”. You may be quite surprised/daunted/disappointed by the sheer amount of clothing you own. Now is the time to take a deep breath and accept the fact that you may have too many clothes. It’s also the time to accept the fact that you are doing something about it. Remember this moment; you don’t ever want to return to it. Some of you already want to stop reading. You may be thinking, “There’s no way, I don’t have the time to finish sorting this all right now. I don’t have the space to do this. My little ones will trip over or spill things on my pile.” Don’t worry, you don’t have to keep this entire mountain of clothes out all at once unless you prefer to do so. I like to toss everything onto my bed so I am motivated to finish before bedtime. You don’t have to if you are not comfortable with this idea. You do, however, have to give yourself the shock treatment necessary to finish this project. Therefore, at least for a few moments, everything must be laid out in front of you. The next step towards having a decluttered wardrobe is to sort your mound of clothing into manageable categories. All pants into one pile, shorts into another, and skirts into yet another. Other categories could be short sleeve tops, tank tops, t-shirts, long sleeve tops, sweaters, etc. You may end up with twenty or so mini-mountains. That is the goal. 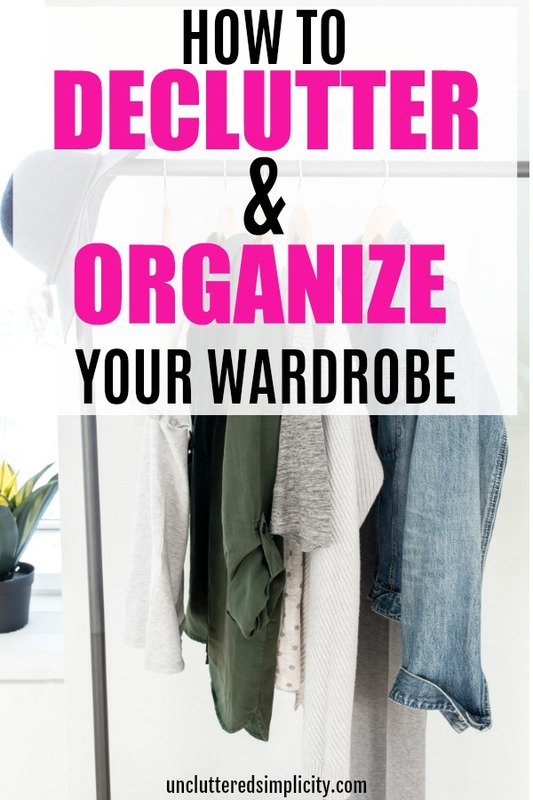 It is during this step where, if you were overwhelmed by having everything out, or you simply do not have room in your schedule to complete this process all at once; you can set some categories aside in a safe spot (preferably NOT back in your closet or dresser) to work on as time allows. You’ll need four boxes or bags for the items you will be parting with, as well as an area to place the articles of clothing you are keeping. Box number one will be for the items you want to discard. For example, items that are unsuitable for anyone else to wear or that you cannot re-purpose. Box number two will be for items you can re-purpose. That is, any item you can salvage for cleaning rags, fabric for crafting, buttons, and zippers, etc. Box three will be for the items which you will be donating. These are articles of clothing you will be bringing to a donation center or passing on to a family member or friend. The final box or bag will be for the items you plan to sell through consignment, yard sale, or an internet site. Glance over the piles before you. You will immediately recognize a few of your favorite items of clothing. Items that you wear frequently, love and are not damaged, can go directly into your “keep” pile. See, that was easy. Likewise, any items you cannot stand to look at, are damaged beyond repair, or that you have never worn, can be placed in their respective boxes for disposal. Now to deal with what’s left. Pick a pile, any pile. Pick up each item of clothing and inspect it. You may need to try it on if you are not sure it fits. If it no longer fits your style; get rid of it. If it doesn’t fit; get rid of it. If it fits, but you never wear it because you don’t feel good wearing it; get rid of it. You get the picture. Your goal is to end up with a wardrobe you’ll love, that fits who you are NOW. Not who you were 5-10 years ago. Not who you hope to become. You are searching for the items that will make you feel comfortable with yourself now. Ones you will be happy to wear over and over again. Rinse and repeat with the remaining piles until every item of clothing has been sorted. Turn your attention to your “keep” pile. Go back over the clothing in this pile and sort again into categories (pants, shorts, shirts, dresses, etc.). Do you notice a trend? Are you perhaps seeing lots of one category such as skinny jeans, button-up shirts or sweaters? If so, congratulations. You have discovered your “style”. Now, you will need to go through and re-evaluate each item. For example, looking at your pile of pants. How many did you decide to keep? Five, ten, fifty (or more)? How many pants do you actually need? Take a minute and consider your lifestyle and needs. Do you work outside the home, or in/from home? Do you wear pants every day, or do you alternate with shorts and skirts? Are there any pants in the pile which do not fit with your overall style, but you decided to keep them based on the idea of your future self? By asking yourself these, and any other questions you can think of, you may find you are able to part with a few more items. You may, on the other hand, discover you do not have enough pants. Don’t go shopping yet! While you may end up with “only” two pairs of jeans that you love, those two pairs may end up being enough when combined with whatever shorts, skirts or capris you decide to keep. Continue re-evaluating each item in your “keep” piles, one category at a time. Ask yourself the questions listed above. Be as objective as possible. Never ask your spouse, significant other, or best friend what you should keep. This is YOUR wardrobe. Only you will ultimately be able to decide what stays and what goes. Once you’ve whittled your clothing down to the items you want to keep, imagine the possibilities. Look for ways you can pair items together. Try out different combinations. Use items in different ways. Don’t be afraid to mix and match patterns, colors, and textures. Layer items for different looks. Treat yourself to some new, matching hangers. I use a set like these for tops and dresses, and these for pants, shorts, and skirts. Hang the items you have decided to keep in your closet or fold and place neatly in drawers. You may discover your clothes have more “breathing” room. At this time, you can store away off-season clothing if you live in an area with fluctuating weather conditions. Neatly store seasonal clothing in clear/labeled bins in your closet, attic or garage until needed. Only keep in your closet and drawers the clothing you be wearing for a season or two. I live in a four-season climate. I like to keep my Fall/Winter clothing out from October-March and switch to my Spring/Summer wardrobe from April-September. Do what works for you. Identify any holes or missing must-have items in your new wardrobe. Make a list of items you’d like to look for and keep it with you when you go shopping. You may be lacking a cardigan that you think would go perfectly with multiple items in your wardrobe. Add it to your list and keep your eyes peeled for the right one. Don’t think you have to buy the first one you see because it’s on sale. Refuse to settle and be patient. You may discover the cardigan you are looking for at a thrift or consignment store. Or you may even find it in the closet of a generous friend. Once you’ve finished decluttering your wardrobe, you will be able to evaluate your accessories, handbags, and shoes with more clarity. These categories are not for the faint-of-heart! Many people, women especially, are sentimentally attached to their accessories, handbags, and shoes. If you suggest they part with even one, you may have to run for your life! Go back to step one and sort through your accessories, handbags, and shoes systematically. Be as ruthless and objective as you can. You may find you are attached to items you never use or wear. This may be because of the money you spent to obtain them. You may experience remorse, anger or regret. These are perfectly normal responses. Do not keep an item because you inherited it, it was a gift, or because you spent hundreds of dollars on it. Only keep the items you know you will wear. If you have a pair of shoes that you only wore with a certain dress which you have discarded; discard the shoes as well. Evaluate how well your accessories, handbags, and shoes coordinate with your new, streamlined wardrobe. Have a little personal fashion show to help you decide. Keep the versatile pieces and discard the rest. Sell the more expensive pieces and use that money to fund a spa day or to fill gaps in your wardrobe. Remember those boxes you started with? Now is the time to deal with them. Your goal will be to remove them from your house as soon as possible. For items that need to be re-purposed, get to work on them immediately. If this box is not dealt with in 30-60 days, dispose of it. Seal the box(es) that need to be donated, put them in your vehicle or beside your door and make donating them a priority. Do NOT dig back through them! Finally, for items you wish to sell, bring them to your nearest consignment shop, post them online, or seal them up and sell them in your next yard sale. Again, no pick-overs. Immediately throw away the articles of clothing labeled for discard. Don’t let them sit in your home or they may end up mixed back in with your “keep” clothes and you’ll have to start all over! Some may disagree with my decision to part with clothing that does not fit. If you are a woman who is 3-6 months postpartum, by all means, keep some favorite items from your pre-baby wardrobe! Just know, not everyone bounces back to their before-baby-body. In addition, not everyone feels comfortable wearing their old clothing once they become a mom; short shorts and low-cut tank tops anyone? Besides, part of the fun of having a baby is going shopping for your new wardrobe that fits your new life and new body. Am I right? As far as keeping clothing you’ve grown out of in the hopes of fitting back into it “one day”. Unfortunately, I have had plenty of experience with this. Personally, I am not in favor of holding onto this part of my wardrobe. For me, looking at the clothes I can no longer wear fosters feelings of disappointment and regret. As a result, I don’t look at them as motivation as some people might. Instead, I berate myself for “letting myself go”. In my opinion, I’d rather let the old wardrobe go and feel good about who I am now by wearing clothing that’s comfortable while still working to get down to a healthy size. When this happens, I can always find new clothes. Besides, styles change, and my old wardrobe may no longer fit in with the “new” me once I lose weight. Ultimately, the only thing that matters, is how you feel. Which items you toss, keep and store is completely up to you. Well, how did it go? Hopefully, you are enjoying your new wardrobe as well as the space created from your decluttering. The key now will be to maintain your new, streamlined wardrobe. When you bring home a new item of clothing, see if you can part with something already in your wardrobe. Periodically review your closet and drawers. If there is anything you haven’t worn all season, perhaps you can part with it. Take care when laundering your clothing. Only wash clothing when soiled. Hang items to dry when possible in order to prevent wear and tear. Think of your closets as valuable real estate. Don’t let items linger without paying rent. If you don’t wear it or love it; evict it.